It is no secret I am a huge Katy Evans fan and The Real series is up there with my all-time favourites. These characters have embedded themselves into my heart and head and any Katy Evans book is always eagerly anticipated and gratefully received. There is something about Katy Evans’s writing that resonates deep within my heart and soul. Every single character that she has created has wormed their way into my affections and I cannot help but devour every word. So it was with anticipation and bated breath that I dived into Ripped. Although Pandora has appeared in previous books she has always been quiet and lurking around in the background. It was only when trying to place her that I realised that we actually know hardly anything about her, only that she was very anti-men and seemed very introverted and all woe is me. It wasn’t until I started this story that I realised the reasoning behind her outward persona. Pandora had had her heart broken when she was just seventeen, something that she had never, ever got over. Adamant that she was never going to be put in that position again, Pandora put up the walls that guarded her heart, a seemingly impenetrable fort that no one had ever been able to penetrate or infiltrate. Seemingly permanently scarred by her past she lived a day by day existence, never happy, forever despondent and melancholy. I felt so sorry for her and I wanted to know “the who” that had caused all this pain and anguish. When an opportunity to exact revenge on the man that had broken your heart materialises, most women would probably grab it with both hands and that is exactly what Pandora does. MacKenna Jones the lead singer of Crack Bikini (Katy, where on earth did this name come from?) is the man behind the despair that invades Pandora to the core. Six years’ worth of anger, pain and hate has manifested itself and is about to be unleashed to the unsuspecting MacKenna, but this can only lead to trouble. First and foremost this story is about second chance love and this is one of my favourite romances to read about. This story is also about misunderstandings and forgiveness and being the bigger and better person. Delving deep down within the recesses of your heart and mind to remember what was present before the hurt, remembering the old you and letting yourself be open to be that person again. It is a huge struggle for Pandora but I have to say MacKenna does not make it easy for her to stay in those deep dark recesses of her past. When MacKenna goes all out, he goes all out and this made him such an endearing character. His rock star persona is a far cry from the beautiful person on the inside and once he is aware of what has happened in the past and the reason behind their circumstances he makes it his mission to get back the girl that he has always loved. I loved the fight, I loved their journey, and I loved it all. Katy Evans has a way with words that manages to evoke all of my emotions and this was an emotional read. 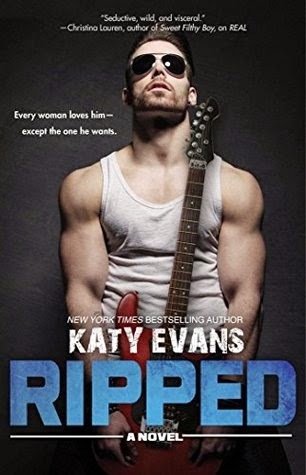 But it is not all angst and tears; Katy Evans has interwoven all of the above with some steaming hot scenes too along with a smattering of wit and humour. All in all a fantastically balanced book that has a bit of everything to whet everyone’s appetites. Katy Evans really put me through the mill with this one and it was an incredible journey to take and one that will stay with me for a long time but this was a great addition to a fantastic series and all of our favourite characters make an appearance at some point. Kudos to Katy Evans on another great read. I can’t wait to see what she pens next; I will be at the front of the queue. RIPPED – I’m so excited to be sharing with everyone RIPPED, Real series book #5! Things are about to get RIPPED during Mackenna’s concert tour when his manager thinks it brilliant to force Pandora to tag along.